Do you know what? Blogging is hard! There I said it. Well, actually I said it in the title as well which is probably why you are reading this post in the first place. I really want to be a blogger and to be a writer in general. While I know I have a book inside me (don’t we all! ), the odds are not exactly high for having it published in the future. I have swallowed hard and accepted that. Blogging satisfies my creative outlet for now. 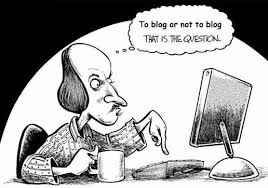 A lot of people still seem to dismiss the idea of blogging. ‘Why would you want to put details of your life online?’, they ask. Relax guys, it is not like I have a copy of my passport on here. Others seem to dismiss it, and especially more popular and successful bloggers, as something that is really easy and which anybody can do. if only that were the case. My two pieces of kryptonite are time and ideas. I work full-time and was taking German lessons and barely had time to relax let alone blog. I used to do it during my lunch break but having no break from the computer was a strain. It is also hard to come up with ideas, especially original ideas. I guess I do have some yes, but a niggling doubt that people will read them is nestled inside me. That was such a rant-y post but maybe by getting it out there people can help me. Any tips on how to juggle this blogging malarkey and do it good are always welcome.